Discover a new author with exhilarating excerpts from historical romantic suspense's stars. Each thrilling scene will entice you, drawing you in with mystery and intrigue. 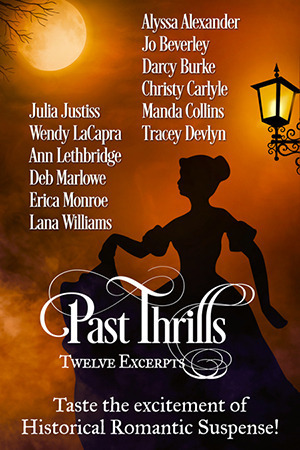 Featuring twelve bestselling and award-winning historical romance authors. For more information, check out www.PastThrills.com. Please note these are FREE excerpts, not the full books. Too Dangerous for a Lady by New York Times Bestselling Author Jo Beverley - Meeting an old flame leads to fear, abduction and a threat to all London - but nothing's too dangerous for a lady in love. Shev by USA Today Bestselling Author Tracey Devlyn - A Marquess of Shevington's bleak existence sparks to life after hiring a mysterious governess whose secrets stir his curiosity and whose courage awakens his desire. Beauty and the Rake by USA Today Bestselling Author Erica Monroe - When a scarred woman with a terrifying past agrees to spend two weeks with the roguish Metropolitan Police inspector who owns her father's gambling debts, desire just might be the key to a happily ever after. The Leading Lady by USA Today Bestselling Author Deb Marlowe - Lord Truitt Russell will do anything to apprehend the criminal Marquess of Marstoke, even ask for the help of the stubborn, irritating, gorgeous Callie Grant, but when fate demands a decision between revenge and love, which will he choose? Romancing the Earl by USA Today Bestselling Author Darcy Burke - A reluctant earl and a bold adventuress join forces to solve his brother's murder and search for a valuable artifact, but amidst the dangers they face, passion may be the greatest threat of all. In Bed with a Spy by RITA-nominated Alyssa Alexander - The Marquess of Angelstone, code name Angel, is searching for the assassin that killed his fiancée four years ago. His only suspect is the woman who has captured his heart. Lady Vice by Wendy LaCapra - When a fallen baroness is accused of murdering her estranged husband, her first love becomes her last chance. Reckless Wager by Christy Carlyle - Set against the backdrop of London's dangerous East End in 1888, Victorian propriety and passions collide when a beautiful widow makes a wager with a wounded police detective bent on solving the Ripper mystery. Captured Countess by Ann Lethbridge - where double agents play a seductively dangerous game in Napoleon's war with England. Shattered Secrets by Lana Williams - The new Earl of Berkmond reluctantly offers a marriage of convenience to his childhood friend, but his passion for her collides with the terrible secrets of his past. The Rake to Rescue Her by Julia Justiss - When jaded Alastair Ransleigh begins an affair with the woman who once jilted him, hopes of finally escaping her spell change to a determination to rescue her from past misery and present danger. A Good Rake is Hard to Find by Manda Collins - Leonora Craven is desperate to know just how her brother died, but to find out she'll need to join forces with her former love, Lord Freddy Lisle. Can a false betrothal help them gain entrance into the notorious Lords of Anarchy driving club, where fast carriages and danger aren't the only vices on offer?